We’d love your help. 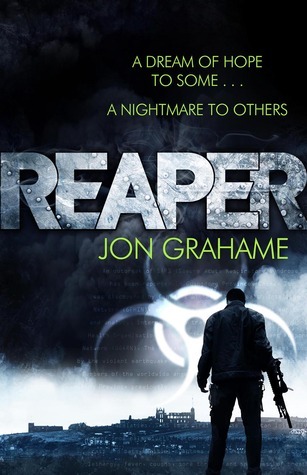 Let us know what’s wrong with this preview of Reaper by Jon Grahame. Seems like a young adult novella. Yet another dystopian future; this one the result of some mysterious disease. A rather pedestrian rendition of the various responses to a complete societal breakdown. There is a military establishment, a dictatorship, a consensus colony and lots of groups that think pacifism will prevail. The whole thing sets up a sequel. Not bad but not particularly engaging. Good premise for the storyline; but badly written and too much gratuitous violence. Really struggled with the last few chapters. Jim Reaper is hell bent on revenge ... the monster who raped his 14 year old daughter is out of prison barely 3 years later and Reaper wants to make him pay. So engrossed is he in his revenge plans that he fails to notice that Super-SARS is hitting the population hard. Those that are left form two factions - those who want to live peacefully, grieve and rebuild and those that will take whatever they want by force. Reaper must decide on which side of the line he stands. won this book via goodreads giveaways and I am very glad I entered. the whole mix of personal greif set in a dystopian post apocalyptic future is an amazing combination, and one that Jon Grahame pulls off really well. I could not put this book down and it took less that 8 hours to finish I was that enthralled. I really enjoyed this book, I found the characters easy to relate to, I liked the storyline, and thought the book was well written. I look forward to reading the next book in this series Angel. I got this as a giveaway with goodreads. What a terrific read! The action comes think and fast but the writing style is very good, the dialogue sincere and the characters well-developed and believable. There were a few tense moments when I thought "uhoh" but there are some softer character-building type bits too. I will definitely be finishing this trilogy, a first class read. I won this through Good Reads First Reads. An interesting combination of revenge thriller and post-apocalyptic science fiction that speculates on the immediate aftermath of a worldwide pandemic wiping out most of humanity. Fast paced and filled with suspense, a definite page turner. This is a true page-turner that I finished in a few days. An excellent post-apocalyptic book, showing just how quickly mankind can descend..
You have got to love Reaper's particular no-nonsense way of justice! I enjoyed this, it was more believable than some of the survivor programmes that I have seen. looking forward to the next book. Read it. The book is interesting and moves well. Some sticky bits but worth the time.